Home / 24/7 / bank / bank of the philippine islands / banking / bea / bea online / bpi / bpi express assists / Express Deposit Machine / online banking / BPI's BEA Goes ONLINE 24/7! BPI's BEA Goes ONLINE 24/7! Ever since I opened a BPI Savings Account, I never had a hard time doing my banking needs - SERIOUSLY. Since then, I never fell in a long line to use the Automated Teller Machines. Since then, BPI Mobile App has been my best friend in transferring funds and paying bills. And since then, I've never been this excited about banking - they keep evolving, you know! Hahaha! Part of their 160th year anniversary, it was August 2011 when they first introduced their facility named BEA or the BPI Express Assist. No, it's not a beautiful bank teller, but rather a suffer efficient machine that simplifies one's over-the-counter bank transaction. If I'm not mistaken, I am one of the first people who tried it, and to be honest, it was a love at first sight. 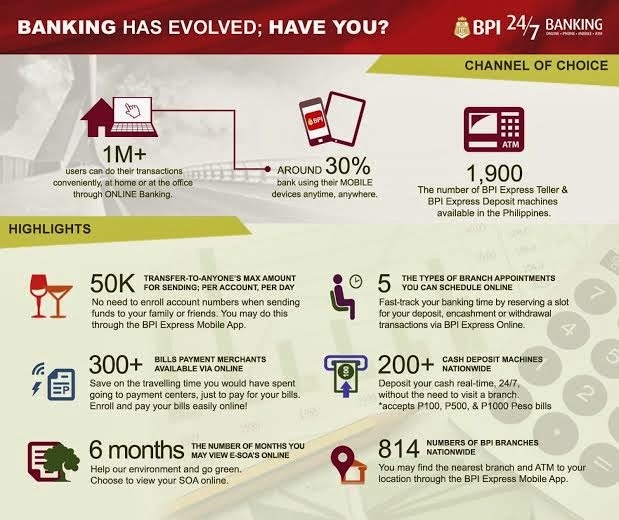 Though I was still with my previous bank back then, I know that time will come that I'll be transferring to BPI due to these innovations. And after two excruciating years, by August 2013, I finally applied for a BPI account... and, yes, my life just became happier. Did you know that their recent innovation has something to do with BEA? Yep, this year, BPI is taking BEA a notch higher as they are sharing her 24/7 with BEA Online. 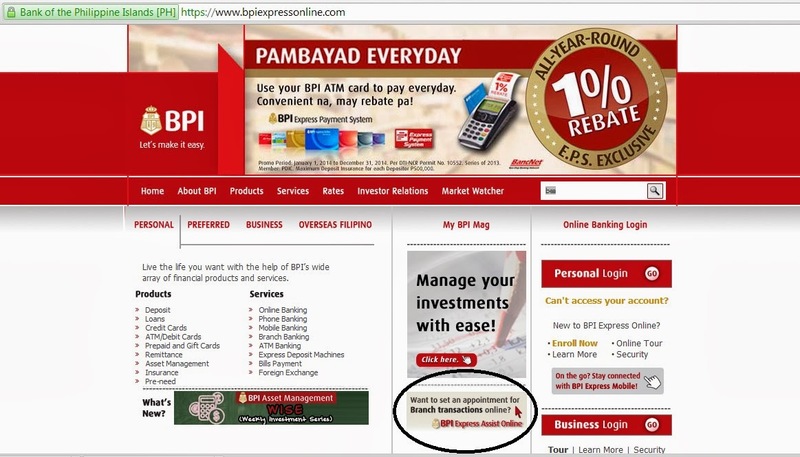 So aside from the fact that one BPI account holders can transfer amount as high as Php50,000; aside from the fact that you can pay your bills to any of their 300+ merchants via online; aside from the fact that you are helping save the environment by instead of receiving a printed out Statement of Accounts (SOA) you can just check 6 months of your SOA online; aside from the fact that you can deposit money through their Express Deposit Machine, which are now 300+ in number and scattered in 814 BPI branches nationwide; and aside from the fact you can simply log on to your BPI Mobile App to do 5 of the branch appointments, you can now "book" your appointments anytime convenient to you via BEA Online! BEA Online is a facility that allows individual to fast track their banking time by reserving a time slot for him/her in the branch. Yep, just like booking a flight, or reserving a slot on your favorite parlor or even purchasing a sure-seat cinema ticket, BEA Online allows us now to do that! TWO: Get your queue number on the spot. This one will be given to you, once you placed all the necessary details needed for your transaction. THREE: Show up for your appointment and shorten your waiting time at the branch! Our BPI friends say that the actual transaction time may vary depending on volume of preceding transactions. Though as of now, this facility is currently limited to selected branches, they are assuring their clients that BEA Online will be progressively made available in more branches soon to make sure that each BEA Online user will enjoy its full benefits. The transactions that one can do via BEA Online are deposit, withdrawal, bills payment and funds transfer (again, mobile/online banking only allows up to Php50,000 transaction). So, I guess, the one that would benefit from this BEA Online are those who will be doing bank transactions with amounts bigger that Php50,000. It will be also beneficial to those who have a hectic schedule, and lastly, it will be beneficial to those who give time extra value. Make your life easy, open an account at BPI now!